Robot Guard: [after shooting at the Starchaser] That was just a warning shot. Reduce speed and prepare to be boarded. Dagg: [to Arthur] Don't bother with the shields. That bot's about to get a laser-enema. 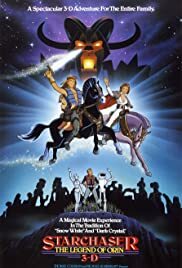 When I first saw this film I was 9 years old. I rented it off a man who hired films from the back his car. I most of rented it 20 times, before the man stopped coming around. I've been searching for this film, to buy ever since, without success. It is a truly remarkable animated film that I would love to see again.